Donna Goodwin, Barrie Price and Peter Murphy are Wagga Wagga band Left of Country. We have just released our second album simply entitled Christmas. The album has six original songs, all written by Peter. The songs are all easy listening songs about the good things at Christmas time. 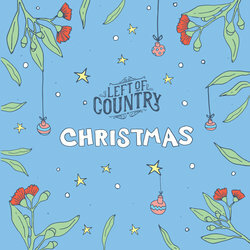 Left of Country have been playing together for just over two years. Donna sings and plays a range of ukuleles. Barrie has been a bass player for many years, sings harmonies and plays with a number of bands. Peter plays rhythm guitar and sings occasionally. We have all retired from full time work and do a lot of our performing on a voluntary basis, especially at aged care centres. We also enjoy playing at community functions and music festivals. We recorded the Christmas album with the help of Grant Luhrs and some wonderful local musicians at Flying Fox Studios in Wagga. The album was released in November 2018 and has six original songs. Many of us think of Christmas as a time for coming home and seeing the ones we love. This song is a story about the journey home on Christmas Eve and thinking about what Christmas will be like.